Who advised Ruth to marry Boaz? WEATHER Changes Threaten Disaster for U.S.A. Weather Bureau experts are frankly frightened about America's future. They KNOW that within 20 years this nation will be toppled from its dizzy economic heights by the worst drought in history! Here are the FACTS and what prophecy says WILL HAPPEN! The assistant Chief of the U.S. 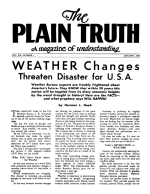 Weather Bureau, I. R. Tannehill, painted a gloomy future for America in one of the nation's leading magazines. The last few years of drought and floods are just a foretaste of famines soon to occur! "Real trouble," he states, "is just around the corner." By the 1970's, he continues, "our water demands may make the supply critical even in good rain years.